(Reuters) – Canadians who go abroad to join militant groups such as Islamic State pose a threat on their return home and could use their foreign contacts to set up networks in Canada, the country’s intelligence director said on Saturday. Michel Coulombe, director of the Canadian Security Intelligence Service, wrote in a Globe and Mail article that “well over 100 Canadians,” both men and women, have left the country to join groups such as al-Qaeda and al-Shabaab. “The most obvious national-security threat is the one posed by extremists who return,” Coulombe said. “How many are coming back to Canada more radicalized than when they departed? Will their status as veterans of a foreign conflict better enable them to recruit other Canadians? WASHINGTON — Earlier this year, President Obama likened the Islamic State in Iraq and Syria to a junior varsity basketball squad, a group that posed little of the threat once presented by Osama bin Laden and Al Qaeda. On August 9 a tweet sent with the hashtag #AMessagefromISIStoUS shows someone holding a piece of paper with Arabic writing in front of the Old Republic Building in Chicago. ISIS/Islamic State has also made threats towards New York City, Washington D.C., and other locations (see Obama says he will not allow Islamic State to carve out caliphate, Islamic State wants to take Washington, D.C. and destroy NYC.). The Islamic State and its supporters are terrorist threats. Ultimately, I believe that the USA and others will endorse some type of Islamic confederation in the Middle East and North Africa to attempt to prevent terrorism. While that may work for some time (cf. Daniel 9:27, The ‘Peace Deal’ of Daniel 9:27), ultimately this will not work out well for the USA or UK per Psalm 83:3-8). But in the aftermath of the Sept. 11 attacks — in the Vatican’s mind an “unjust aggression” — John Paul defended the “legitimate fight against terrorism,” and the right of nations to defend themselves against terrorist attacks. 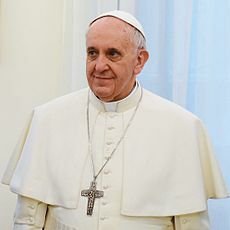 He did though call for restraint and the Vatican subsequently focused its position on emphasizing the need to eradicate the root causes of terrorism: poverty and oppression. Francis was thus essentially applying church teaching on the “just war” doctrine to the Iraq situation. Unlike the Church of Rome, the Church of God has always opposed its members participating in military and similar violence. See also Military Service and the Churches of God: Do Real Christians Participate in Carnal Warfare or Encourage Violence? Pope Francis may look like a lamb to some, but he truly speaks like a dragon (cf. Revelation 13:11). That being said, the Islamic State is a terrorist threat. Yet, the only real way to bring peace to the earth is the return of Jesus Christ and the establishment of the Kingdom of God. Interim steps by governments and leaders will have various affects, but they will not prevent the coming of the Great Tribulation and the destruction of nations such as the USA, UK, Canada, Australia, and New Zealand (see Will the Anglo-Saxon Nations be Divided and Have People Taken as Slaves?). This entry was posted on Saturday, August 23rd, 2014 at 7:00 am	and is filed under Prophecy, Religious News.